Anna Polonsky is widely in demand as a soloist and chamber musician. She has appeared with the Moscow Virtuosi, the Buffalo Philharmonic, the Saint Paul Chamber Orchestra, the Columbus Symphony Orchestra, the Memphis Symphony, the Chamber Orchestra of Philadelphia, the St. Luke’s Chamber Ensemble, and many others. Ms. Polonsky has collaborated with the Guarneri, Orion, Daedalus, and Shanghai Quartets, and with such musicians as Mitsuko Uchida, Yo-Yo Ma, David Shifrin, Richard Goode, Emanuel Ax, Arnold Steinhardt, Peter Wiley, and Jaime Laredo. She has performed chamber music at festivals such as Marlboro, Chamber Music Northwest, Seattle, Music@Menlo, Cartagena, Bard, and Caramoor, as well as at Bargemusic in New York City. Ms. Polonsky has given concerts in the Amsterdam Concertgebouw, the Vienna Konzerthaus, the Alice Tully Hall, and Carnegie Hall’s Stern, Weill, and Zankel Halls, and has toured extensively throughout the United States, Europe, and Asia. A frequent guest at the Chamber Music Society of Lincoln Center, she was a member of the Chamber Music Society Two during 2002-2004. In 2006 she took a part in the European Broadcasting Union's project to record and broadcast all of Mozart's keyboard sonatas, and in the spring of 2007 she performed a solo recital at Carnegie Hall’s Stern Auditorium to inaugurate the Emerson Quartet’s Perspectives Series. She is a recipient of a Borletti-Buitoni Trust Fellowship and the Andrew Wolf Chamber Music Award. Anna Polonsky made her solo piano debut at the age of seven at the Special Central Music School in Moscow, Russia. She emigrated to the United States in 1990, and attended high school at the Interlochen Arts Academy in Michigan. She received her Bachelor of Music diploma from The Curtis Institute of Music under the tutelage of the renowned pianist Peter Serkin, and continued her studies with Jerome Lowenthal, earning her Master's Degree from the Juilliard School. 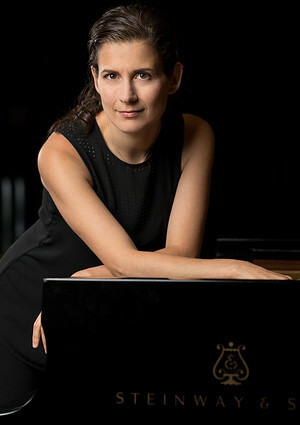 In addition to performing, she serves on the piano faculty of Vassar College, and in the summer at the Marlboro and Kneisel Hall chamber music festivals. Highlights of Ms. Polonsky’s 2017-2018 season have included performances in China with Yo-Yo Ma, and at Carnegie Hall with Peter Serkin. Beginning in 2019, she will perform as part of a trio with clarinetist David Shifrin and cellist Peter Wiley. Ms. Polonsky is a Steinway Artist.